Giles County, VA- Earlier in November members of the local ReNew The New Committee from Giles County traveled to York County, Virginia for the annual Soil and Water Conservation Society awards ceremony. Nominated by the New River Valley Regional Commission the local committee was awarded the 2016 Merit Award “for their successful partnership to improve the health of the New River through organized cleanup activities” at the gathering. The ReNew the New committee develops multiple events a year to clean sections of the New River. Photo by Alisa Moody. The nomination letter included compliments to the local committee and Giles County for the regional success of the river cleanup held on August 27, 2016. The nominating application shared that “it successfully brought together groups representing industry, advocacy, government, students, youth, and the public” allowing for a positive impact on towards a “common cause,” the continued cleanup and awareness efforts of the New River. For the past ten years ReNew The New has hosted two annual clean ups. A spring event focuses on roadways or river access points and is referred to as Ramps-N-Roads. The 2016 event held in Giles again brought record crowds and continues to be a popular community event along the New River Water Trail. In the early fall the popular Fall into the New event gets volunteers onto the water to clean up various sections of waterway. This year the entire New River Valley region was involved and for that effort, received this award. 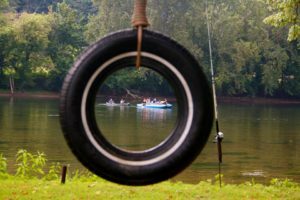 On August 27 volunteers from Floyd, Pulaski, Montgomery, and Giles County, as well as the City of Radford joined together at Bisset Park to clean up a 10-mile section up and down river of Dudley’s Landing. The event brought together the communities and over 450 volunteers and successfully removed over two tons of debris from the river. This effort has “improved the environment through the clean-up of the region’s main water source; it united a group of volunteers representing a variety of backgrounds and interests and it educated the public about the importance of the New River to the region” as stated in the nomination application. The award was presented to committee member Paul Moody at the recent event and has been presented to the local ReNew the New Committee with much appreciation. The 2017 event details are still being developed, but the Merit Award and regional attention have garnered more awareness for the New River and the efforts to maintain and improve the important waterway. 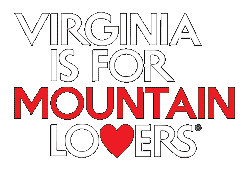 For more information on the ReNew the New activities please visit their website at http://renewthenew.org/ or http://virginiasmtnplayground.com/.